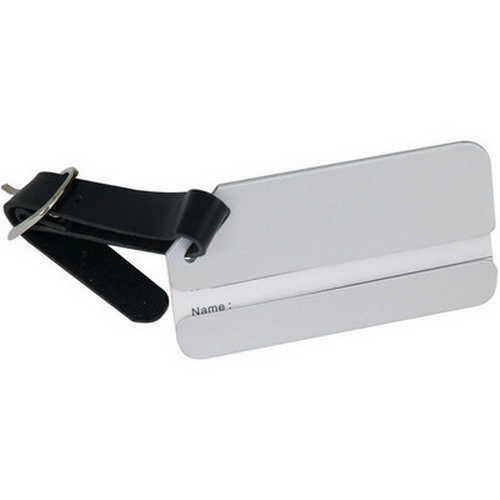 Aluminium luggage tag. Leather strap. Card insert for passenger details. Ideal for laser engraving. Boxed. Product Size: 85 x 55mm. Product Packing: Boxed. Decoration Size: 50 x 15mm. Decoration Position: Front and back of luggage tag. Decoration Method: Pad Print | Laser Printing. Carton Quantities: 400. Carton Size: 41 x 27 x 41. Carton Weight: 10. Colour: Silver. Price includes: See drop down menu for decoration options.